Recently, we talked about what change managers do to confront active, loud and direct resistance to a change. But as most of us know, that isn’t the only kind of resistance that we as change managers face on a project. Resistance can also be a quiet refusal to engage with a new solution, a 0% adoption of a new process, or lack of attendance at training or awareness projects designed to support the change. Here at Prosci, we call this kind of resistance passive resistance and it can be just as deadly to a project as its more active sibling. But what do we do when we encounter this kind of passive resistance? How can we confront it, address it and manage it to make sure that our project or initiative is still successful? Sometimes called “change champions,” other times referred to as “change agents,” the research is clear: Surrounding impacted groups with as many positive influencers as you can dramatically changes the perceptions that your passive resistors have of the change. 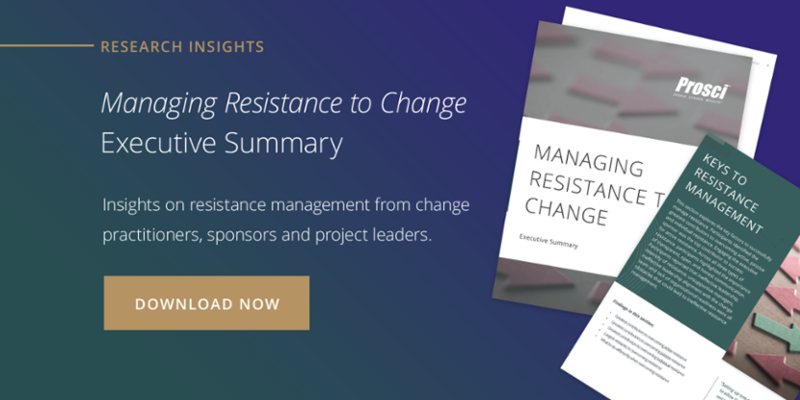 Sometimes all people want is a seat at the table and sometimes offering that seat can dramatically improve your project outcomes (see the section on Constructive Resistance in the Managing Resistance to Change report). Enlisting the aid of people most impacted by the change can dramatically help you mitigate their resistance to the change and may even help you improve your own solution design. If you are at all familiar with our other research report, Best Practices in Change Management, then this contributor should come as no surprise to you. Leaders or sponsors can provide clear messaging and leadership by example, and can articulate the “why” of the change. However, they must be involved, in the thick of the change, and seeking out opportunities to demonstrate buy-in, lead by example, and communicate about the change. Resistance comes in many shapes and sizes, and it doesn’t need to be an angry person yelling at you in a meeting for it to be deadly to your project. Passive noncommitment to the change can be just as deadly as any other form of resistance. Confronting and addressing this kind of resistance before it can drag your project or initiative down is crucial to your change success.